Regarding John Yau, and Joshua Beckman & Matthew Rohrer: The three readers tonight write what I consider to be fresh poetry. Not that their constructions are without precedence. Strains of Surrealism, Dada, the New York School, Concrete Poetry, and the clean surprise of haiku and tanka are evident at various times in the work they offer. Clearly they are students of the art. The notion of freshness I mean is hard to delineate. It is what lives inside the art and outside the artistic movement; is what artistic movements feed on, in fact. I’ll offer a definition for fresh in my usage – I remember finding a weathered salmon vertebrae on a beach. It was lovely, and both integral to that day and place, and completely other than anything else around; precise, mysterious, and wholly self-contained. While it may seem odd to define freshness by citing a bone, freshness is clearly allied with the odd. Poems can be as simultaneously crucial and temporal creations as are bones: oddities of structure that support life awhile. Tonight’s readers provide poetry that fits that definition. John Yau has published poetry, fiction, critical looks at contemporary art and artists, and collaborations with visual artists. 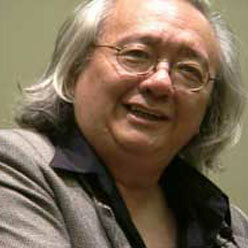 He has some thirty-four titles to his credit and is a vital, and under-recognized, presence in American poetry. The Work in Borrowed Love Poems, his most recent collection, displays his talent quite nicely. The writing is lively and intelligent, ranging from a poem made of nouns in which he calls each of the lines a sketch, to monologues in which he inhabits non-Asian actors who played Asians in the movies. Mr. Yau’s work in untethered in a most delightful way. He conveys pictures, thoughts, confusions, and emotions, at calculated times and degrees. His poems always exhibit high wit and his artist’s delight in the materials of the art form. And I would be doing an injustice if I didn’t single out his wonderful and all-pervasive sense of humor, and its off-spring, his mastery of the proper noun. Who hasn’t attended at least one show in The Museum of Modern Fate? Excerpt from program notes from a reading with John Yau, Joshua Beckman and Matthew Rohrer on Tuesday, October 15, 2002 at the University of Washington. Broadside created by Paul Hunter/Wood Works Press for the poet’s reading for Counterbalance Poetry on Tuesday, October 15, 2002. Printed from hand-set metal type on archival paper with original woodcut. Limited to 145 copies.